Need UK storage? County Removals provide domestic storage, commercial storage and warehousing in the uk. Sometimes it is necessary for you to store your goods for a long or short period of time. Our storage system enables us to load our containers at your door onto our specially designed vehicles (subject to availability). 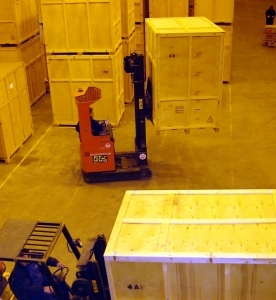 Containers are sealed upon loading and not opened until you are ready for them to be delivered. This means that your goods are not handled several times. It also ensures goods are not mislaid, that your goods are kept separate from others customers’, and that they are kept clean and protected from dust. You will be supplied with a list of the contents of each container. Our warehouse is situated in a gated complex, clean, well maintained and safe, with 24 hour CCTV security. We operate from the same premises so you can be sure your personal effects are in safe hands. We can offer comprehensive insurance cover against all risks whilst your goods are in our custody. There is no limit to the length of time your goods can remain in our care. Our central locations, large fleet of vehicles and extensive warehousing capabilities make County Removals Ltd ideally suited to offer a comprehensive distribution network service for items such as soft furnishings and catalogue deliveries. We regularly accommodate large scale deliveries from and for major shops and also individual deliveries to peoples’ homes. You can also take advantage of our regular European services. Our facilities are large enough to cope with your large or smaller scale warehousing needs. Our competitive pricing structure enables us to provide a quotation regardless of size or quantity. Should you require any further information about our domestic or commercial storage services please contact us.